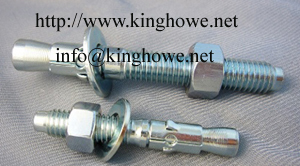 Business Description: We are, Kinghowe Enterprise Co., Ltd Manufacturer, R&D, Sales as one of professional fastener Anchors manufacturer. We have more than 15,000 square meters of modern plant and modernization of production equipment. Located in Zhuhai City. Professional production fastener Anchors with DIN, ANSI, ASME, ISO, GB, JIS standard. Our main products are Wedge Anchors, Hex Nut Sleeve Anchors, Drop in Anchors, welded Anchors, Split Drive Anchors, Set Wall Sleeve Anchors, M.M Sleeve Anchors, Set Wall Anchors, Hook Sleeve Anchors, Tie Wire Anchors, Cut Anchors, Expansion, Spring Toggle, Hollow Wall Anchors, Metal Frame Anchors, Zinc Anchors, etc, which are widely applied to automobiles, mechanism, moulds, electron and architecture. Quality is life of an enterprise. So we have introduced a full set of specialized imported fasteners quality testing instruments for improving our quality. Talent is fortune of an enterprise. we have integrated a professional team of design, R&D, manufacturing, marketing, sales, finance, logistics and after sale service to meet the request of all customers. We always offer the excellent in quality and perfect in after sales to every customers.